The site where the village extension project is being carried out. The roof of the shrine is partially seen to gauge the proximity of the village extension project site across the road. 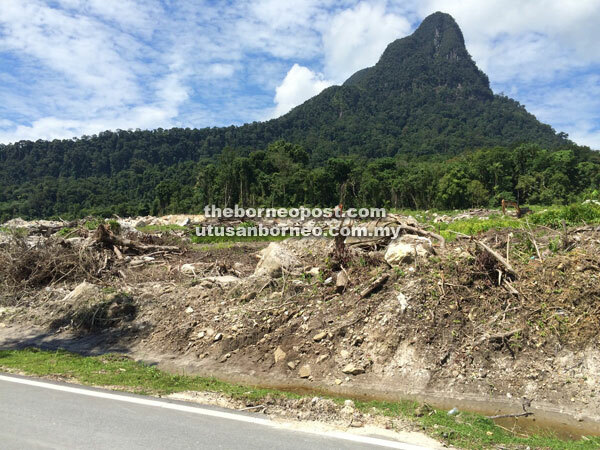 KUCHING: A village extension project carried out within the vicinity of the historical Bongkissam shrine in Santubong is causing concern among enthusiasts of the state’s culture and heritage. 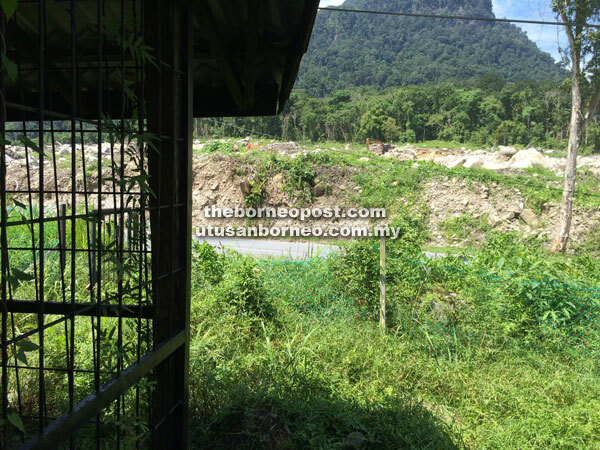 According to Sarawak 4 Sarawakians campaigner Karen Shepherd, the extension project — carried out across the road from the Bongkissam shrine — was executed without conducting any archaeological investigation. “There could have been countless treasures on this site and now we will never know. Whatever was there has been lost to the teeth of the bulldozer,” Shepherd said in a press statement recently. The Bongkissam shrine, she said, dated back to between the 10th and 13th century and was uncovered in the 1960s; several objects found there are currently on display at Sarawak Museum and among them are a silver ritual box and 142 gold objects. This suggests that the site was of sacred significance at one time – making it one of the most significant archaeological finds in Sarawak and perhaps, in Asean. The land-clearing, Shepherd added, might have caused the destruction of priceless artefacts of universal historic and research significance. Thus, she called into question the state government’s intention to create an archaeological park in the area, due for completion in 2019. According to her, the Santubong peninsula had provided artefacts dating back to the seventh century, making the site potentially contemporary to Kutai in Kalimantan which is recognised internationally as a historic fourth-century Indianised kingdom. Some researchers, she added, had also identified Santubong as the site of the city of Poni – the centre of a trading route that sent tributes and emissaries overseas from as early as the fifth century. “The research potential in the area (Santubong) is enormous, putting Sarawak centrestage in international scholarship. Furthermore, there is a tourism potential that comes with that as recognised by the RM6-million Santubong Archaeological Park and Wallace Centre, which was announced by Chief Minister Datuk Amar Abang Johari Tun Openg in his role as Minister of Tourism, Arts and Culture last year,” Shepherd said. She pointed out the land-clearing activities also brought to mind the loss of Japanese wrecks off-coast Santubong to metal salvagers which was reported last year, where efforts to gazette the marine sites were overtaken by petty commercial interests. “In fact, this set of circumstances is being repeated all over the state with precious examples of rock art being lost to quarrying, and historic shophouses to budget hotels. Sarawak is in the midst of a period of reawakening to its own history and significance in the region, supported by an important new museum project and a renewed period of scholarship. Yet, we are losing our sites faster than we can save them,” she added. On another note, Shepherd urged the state government to strengthen the implementation of the Heritage Ordinance in Sarawak. This, she said, would not only protect existing heritage sites but also require heritage investigations to be conducted prior to a construction, particularly on areas of significance such as Santubong. “Of course, we recognise the needs of residents in Kampung Santubong for housing. No one is asking that all building works in Sarawak be stopped indefinitely, but there must be a system to balance heritage needs with their research and tourism potential, with the social needs of the present communities.” She said the state government must establish a framework for the dialogue to take place, whether on private property or on state land. “This kind of work can be controlled through planning permission. Before any permission for work is given by the State Planning Unit or Land and Survey Department, there must be a provision included for heritage investigation. It is unbelievable to me that planning permission has been granted for this project without the involvement of the state Museum Department,” she added. Meanwhile, Pantai Damai assemblyman Dr Abdul Rahman Junaidi when contacted said a discussion would be held between him, the Land and Survey Department and the state Museum Department on the matter. He also said that the village extension project was a government project under an ordinary ‘village extension scheme’.